This tasty midweek meal can be prepared with little or no fuss. The beauty of this dish is that you can cook two gratins and freeze one for a later date. Heat the oil in a large frying pan set over a medium heat. Add the onion, pepper, courgette and garlic and sweat gently for 3 to 4 minutes, until the vegetables have softened. Add the beef and allow it to brown a little before adding the tomatoes, stock and Worcestershire sauce, if using. Bring to the boil, then reduce the heat and simmer for 6 to 7 minutes. To make the topping, mix everything together until well combined. 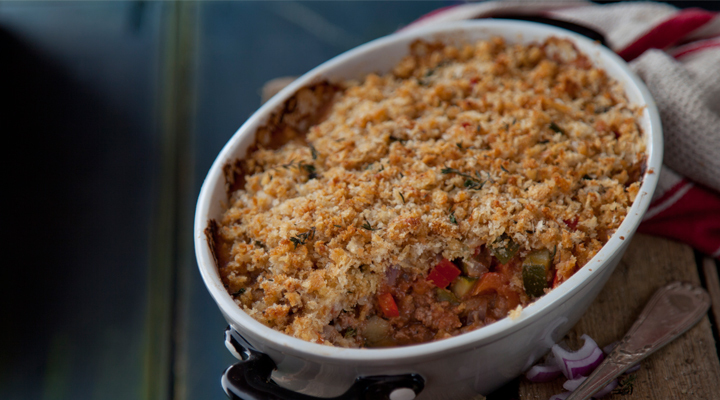 Divide the beef mixture evenly between 2 gratin dishes and sprinkle over the topping. Wrap one of the gratins in cling film, label and date and pop it in the freezer. Defrost thoroughly before cooking at a later date. To cook the remaining gratin, place the dish onto a flat baking tray and pop it into the oven for 20 to 25 minutes, until it’s bubbling and piping hot. Delicious dish. Went down a treat in our house. Went down a treat in my house. Added kale as I had no courgette and some chopped up cooked potato. Very tasty and easy. This recipe was a huge hit. All the ingredients were readily available in my local Supervalu (Ennistymon) with the meat being exceptional value. The gratin was so easy to make. and as stated in the recipe I was able to make 2. There is plenty in the above recipe for an average family of 4/5. For the stock I used a Knorr (Very rich) Beef stock cube. I made my own breadcrumbs. It tasted amazing and will certainly be cooked regularly in future.